The engine of the KTM 300 XC-W has been known and respected for being the most powerful 2-stroke engine in its class. 2-strokes really do have a future at KTM. Their outstanding power-to-weight ratio, low cost and simplicity see to that. 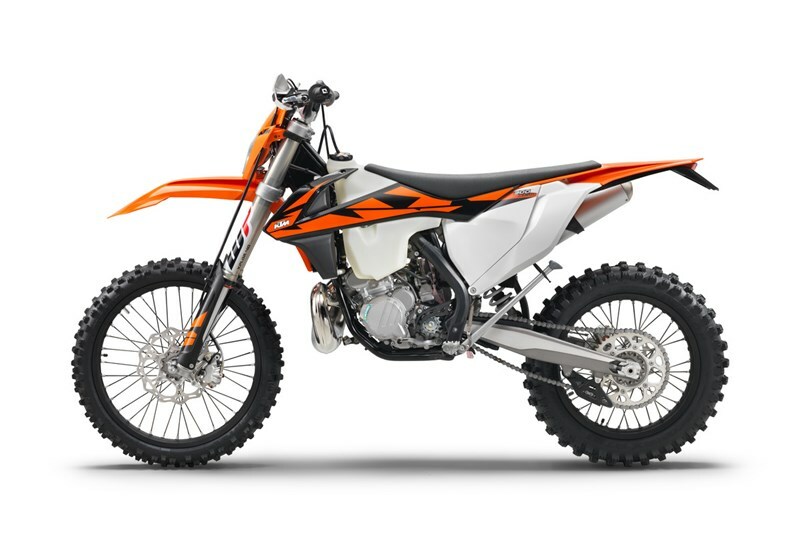 The KTM 300 XC-W engine has been optimized for mass centralization, comes with a twin-valve controlled power valve, a balancer shaft for less engine vibrations, a 6-speed transmission and a hydraulically operated DDS clutch. This compact powerplant lays down the law in terms of 2-stroke power and torque and is the right choice for lovers of low purchase and maintenance costs. Oh, and of course don’t forget that 2-stroke symphony when you’re on the pipe. This compact cylinder with a 72mm bore features a cutting-edge power valve unit with a sophisticated mechanism for the lateral support exhaust ports. Matched to a twin-component cylinder head, it is KTM’s secret to all-round grunt. The layout of the water jackets in the cylinder and head guarantees efficient heat dissipation when the going gets tough. A robust 6-speed transmission, its gear ratios perfectly in sync with the 300’s power band. An advanced ´No Dirt´ gear shift lever design prevents mud and sand from blocking the joint of the lever and guarantees trouble-free shifting. The KTM 300 XC-W is fitted with a MIKUNI TX carburetor. This 38mm flat slide carb lives to provide smooth and controllable power all the way up to the rev limitation. With a new intake manifold the carburetor is turned 7° in order to reduce the overflow of fuel. And it’s less sensitive to different altitudes and temperatures, so you can pin it wherever, whenever. It gets a new setting too, improving power delivery and rideability. Say goodbye to numb feet and hands. This engine design allows the implementation of a lateral balancer shaft in order to keep the vibrations to a minimum. You know what that means: more comfort, less fatigue, bigger smiles, more miles. The KTM 300 XC-W employs the KTM-developed DDS clutch (damped diaphragm steel) with a wear-free steel basket, extremely heat resistant clutch plates and new, nitrated steel liners. This clever design employs a diaphragm spring instead of the usual coil springs, making for considerably easier clutch action. A diaphragm spring also leaves sufficient space for a damping system to be integrated into the clutch hub. The goal is traction, but durability is as well. Light operation and telepathic amounts of control are standard with this hydraulic Brembo actuated clutch. The high-tech, lightweight chrome-moly steel frame has a knack for easy handling, outlandish rideability, precise cornering and excellent stability. You can also count on high torsional rigidity and low longitudinal stiffness. This results in better absorption of the energy created from the front and rear suspension, sucking up jumps and bumps. In short: more comfort and less rider fatigue. Laterally attached, lightweight aluminum engine head stays (the connection between cylinder head and frame) contribute to precise cornering and a reduced vibration level. The engineers were able to pull off all that, while making their frame 2.2 pounds lighter than that of the lightest competitor on the market. In addition, it is easier to maintain, easier to work on and supplies more space for the tank and other components. The bike also features an extra-light subframe made of strong yet light aluminum, which tips the scales at less than 2.2 pounds. The air filter box design offers maximum protection of the air filter against soiling, while ensuring maximum airflow. The large Twin Air filter is mounted in a stiff cage, which at the same time holds the system in place. This design is so simple, you could still pop a fresh one in with a face full of mud. Without tools. In seconds. The XC-W wheels feature lightweight, CNC machined hubs and high-end Giant rims guaranteeing maximum stability at minimum weight. The wheels are fitted with Dunlop tires – perfect for surefooted performance off-road. A lightweight polyethylene tank with a capacity of 2.5 gallons. You will always be able to see how much fuel there’s left at a glance, thanks to the see-through plastic. By pushing the orange release button in the center of the fuel tank cap, the bayonet mechanism makes refueling quick and easy. Sophisticated ´No Dirt´ footpegs prevent jamming up the pegs, even when digging in deep ruts. The pegs on the Enduro models are 6mm higher than the ones used on SX models, which benefits ground clearance. But you can swap them at will.